Everyone's stoked about the New Order these days, so it's no wonder everyone's buying New Order shares! Today we passed the 114,000 and 115,000 milestones, with over 115 billion in shares sold. Unwanted Clone earned the first Supreme Protector's Tip of the Hat™ of the day, vaulting us over the 114 billion mark with his purchase of 591 shares. 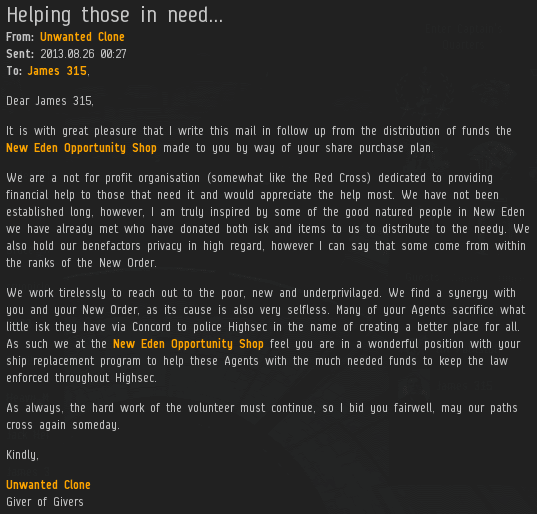 We've only just met, but I can already see that the New Eden Opportunity Shop does good work. Well done! Dr Wiwwy earned the Supreme Protector's Tip of the Hat™ today, his purchase of 750 shares sending us over the 115 billion mark. More shares, more isk, more Catalysts, more ganks, more dead miners. Wonderful. the Knights thank you very much for your hard work,and selfless dedication to highsec.